Pentagram and pentacle are remarkably similar symbols which are associated with mystical elements. They are commonly confused with each other. Some individuals claim that a “pentacle” is just another word for “pentagram”. Hence, these are interchangeable terms for many people and a number of references claim that they are just the same. Also, the differences in interpretations by various groups contribute to the incertitude. A pentagram is created by drawing a continuous line in five straight sections while a pentacle is particularly a talisman or a special object inscribed with a pentagram or any other pertinent figure. Some sources simply define it as an encircled pentagram. The following discussions further delve into their distinctions. A polygon composed of 15 line segments with 10 points. A logogram for the word “ub” which means cavity, angle, corner, nook, or small room. The sharp angles in the figure appropriately denote corners or nooks in a room. It is a symbol of man with the top as the head, the sides as the hands, and the bottom angles as the legs. It also represents the elements which the Greeks believed to constitute the human body: earth, air, fire, water, and psyche. It represented the five books (Genesis, Exodus, Leviticus, Numbers, and Deuteronomy) of the Torah. The star symbolizes Christs’ five holy wounds which He suffered during the crucifixion. It was the symbol of an ancient Celtic goddess, Morgan who represents healing magic, battle, fertility, and sexuality. It is the conquest of matter over spirit which represents evil. Pentacle originated from the Latin words “penta” for “fivefold” and “culum”, a diminutive suffix. It is defined as a pentagram enclosed by a circle which stands for the unification of all the circumscribed elements. Furthermore, the circle emphasizes the direct and indirect connections of what the points represent and a profound reverence for nature. It is also traced to the middle French word, “pentacol” or “pendacol” which is an ornament or charm hung about the neck. Nowadays, pentacles are widely known as talismans inscribed with figures (not only pentagrams) which are made out of wood, metal, paper, or other materials. 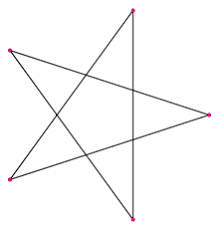 A pentagram with no interior lines with 10 line segments. The coins in the tarot which represent the element earth or deity manifesting in matter. An altar tool which symbolizes the element of earth. It is for cleansing, directing energies, or charging. From its Greek roots, “pentagram” translates to “a figure with five points” such as a star. On the other hand, from its French roots, “pentacle” translates to “an ornament hung by the neck”. A pentagram is defined in geometry as a polygon with 15 line segments while a pentacle is a pentagram with no interior lines with 10 line segments. A pentagram is a star while a pentacle is a star or another figure enclosed by a circle. 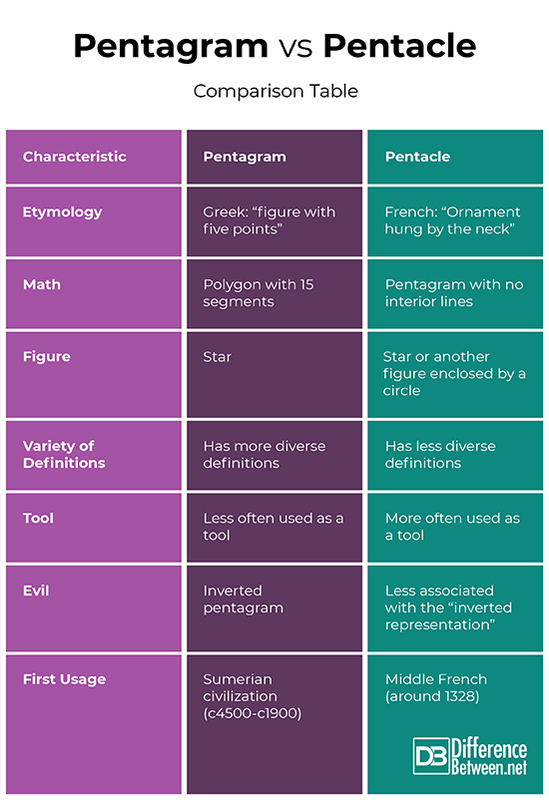 As compared to pentacle, pentagram has more diverse definitions. For instance, Chinese tradition views it as a symbol for the five elements, Pythagoras sees it as a symbol for man, and Christian tradition refers to it as a representation of Christ’s five wounds. As compared to pentagram, pentacle is more often seen as a tool such as a talisman, charm, or protective amulet. Pentacles made out of silver are supposed to heighten psychic abilities and those out of gold invoke wisdom. Wiccans also place it on their altar for protection while warding off negative auras and energies. The “inverted pentagram” is mostly associated with evil, black magic, and cults specially with a goat head inside the symbol. This is the reason why some schools banned the figure in their campuses. However, some wiccan sources claim that it does not necessarily denote evil. As for the pentacle, the term is less associated with the “inverted representation”. The earliest record of the utilization of pentagram was during the Sumerian civilization (c. 4500 – c. 1900 BC) with it being a logogram for “angle”, “nook”, or “room”. As for pentacle, the fist usage was with the middle French word “pentacol” (around 1328) which meant “talisman”. Pentagram and pentacle are very similar symbols which are associated with mystical elements. Pentagram came from the Greek words, “pente” which means “five” and “gramma” for “character” or “what is written”. Pentacle originated from the Latin words “penta” for “fivefold” and “culum”, a diminutive suffix. In Math, a pentagram is a polygon with 15 segments while a pentacle is a pentagram with no interior lines. A pentagram is a star while a pentacle is a star enclosed by a circle. As compared to pentacle, pentagram has more diverse definitions. Pentacles are more often used as tools than pentagrams. The inverted pentagram is associated with evil and infamous cults while the pentacle is less linked with an “inverted representation”. The pentagram was earlier used than the pentacle. gene balinggan. "Difference Between Pentagram and Pentacle." DifferenceBetween.net. September 20, 2018 < http://www.differencebetween.net/miscellaneous/difference-between-pentagram-and-pentacle/ >. Buckland, Raymond. Buckland’s Complete Book of Witchcraft. Woodbury, MN: Llwellyn Publications, 2002. Print. Meredith, Jane and Parma, Gede. Magic of the Iron Pentacle. Woodbury, MN: Llwellyn Publications, 2016. Print. Thomas, William. Talismans. Whitefish, MT: Kessinger Publishing, 2010. Print.